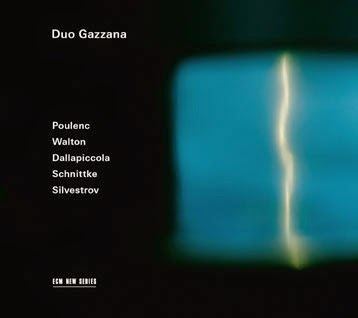 This new album from Duo Gazzana appears to be a labor of love on behalf of Walton’s Toccata for violin and piano. It’s an early work, dating from 1922-23, when the composer was just 20 years old. Natascia Gazzana, the violinist of the duo, has been studying the work for an academic dissertation, and has had access to source materials at the Fondazione W. Walton at his island home on Ischia. It is a fascinating piece, and well worth an airing, but it’s not one that fits easily into a recital program. But the sisters have devised a context for it, based around the Baroque genre of its title. The result is a collection of 20th/21st-century works, each with a connection, however tenuous, to the Baroque era. It’s a diverse mix, and one that stretches well beyond what we might consider “Neoclassical,” even in the broadest sense. Despite the historical allusions and references, every aspect of this recording is thoroughly modern. The recorded sound is as plush and enveloping as on any ECM release, although fortunately (and unusually) none of the detail is lost. The Gazzanas perform in a way that is ideal for the ECM aesthetic: all big, round sounds and emphatic articulation, but with plenty of nuance and subtly when the music requires. Schnittke’s Suite in the Old Style poses the question, in its title as much as its music, which old style? It has been recorded often enough that we can hear a good range of interpretations, from the spartan antico to the plush Rococo. This version is definitely in the second category. It is bouncy and energetic, but throughout the two players project a warm, vivid tone. There is plenty of rhythm here though, thanks to the incisive violin articulations. A desire to push the music on is evident from the lack of space between phrases, yet there is never any feeling of hurry, and the music is always elegantly shaped with minimal but finely judged rubato. The Poulenc Sonata earns its place thanks to its archetypal Neoclassicism. But here too the Duo favors overt expression over historically informed restraint. The reading is bold, passionate, and energetic. Natascia’s gutsy tone in the lower register is ideal for giving this music the kick it needs, and the variety of articulations and colors provided by Raffaella at the piano ensure that this is a deeply involving performance. The Silvestrov work that follows provides a brief calming interlude, but little more, before the action resumes with the Walton. The toccata is an impressive piece, densely textured but clear of line and structure. The piano part is full of heavily pedaled runs, waves of sound over which the violin sings long, lyrical lines. Yet the clarity and balance are never compromised, thanks to Walton’s careful scoring and to the care with which Gazzana sisters present the work. It’s certainly not typical Walton though. On a blind listening, you’d be hard pushed to identify the nationality of the composer, let alone his name. Of the other works on the program, it comes closest in style to the Poulenc, but more for the latter’s dynamism than for his Neoclassical affectations. The Dallapiccola that ends the program brings us back to the neo-Baroque stylings of the Schnittke, although where Schnittke uses German models, Dallapiccola looks to his compatriots, and explicitly Tartini. But the results are very similar. Both works are structured as Baroque suites, with the delicate rhythms and light textures of their 18th-century models ensuring grace and levity. Again, though, the performance is muscular and full-toned, but never to the music’s detriment. An interesting and varied program, then, and an appropriate context for the Walton discovery, which manages to hold its ground, even in the face of significant competition, especially from Poulenc. All of these works could be presented in a very different way, and the Schnittke and Dallapiccola in particular often seem to invite lighter and more transparent textures. But that’s not the way ECM does things, and nor apparently is it the Gazzana sisters’ approach. It’s no great loss though, because they demonstrate admirably that full-blooded, Romantic readings are just as valid and do not compromise the historical allusions that hold the program together.